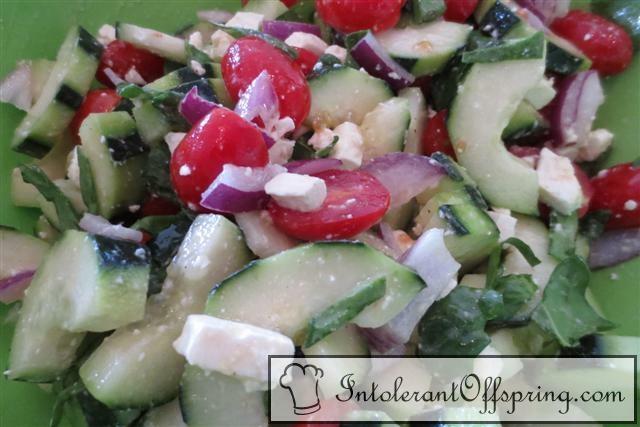 2 medium cucumbers, halved lengthwise, seeded, and diced to about 1/2"
In a large bowl, comibne cucumbers, tomatoes, onion, basil, and feta. Toss to mix. Whisk together olive oil, vinegar, honey, salt, and pepper in a small bowl. Drizzle dressing over salad, toss, taste and adjust seasonings if desired. Serve immediately or chill to allow flavors to blend.